Preheat oven to 180°C. Grease and line the base and sides of a 8 x 24cm (base measurement) loaf pan. Combine the flour, sugar and baking powder in a large bowl. Combine mashed papaya, banana and eggs in a small bowl. Add to the flour mixture with the melted butter, macadamias and extra papaya and gently stir until just combined. Spoon into the prepared pan and smooth the surface with the back of a spoon. Place on an oven tray and bake for 1 hour or until a skewer inserted in the centre comes out clean. Remove from oven. Set aside for 10 minutes before turning onto a wire rack to cool. Cut into thick slices. Serve warm or at room temperature. Tip: Serve with honeycomb butter: beat 100g of soft butter until pale. Add 30g chopped honeycomb and stir to combine. 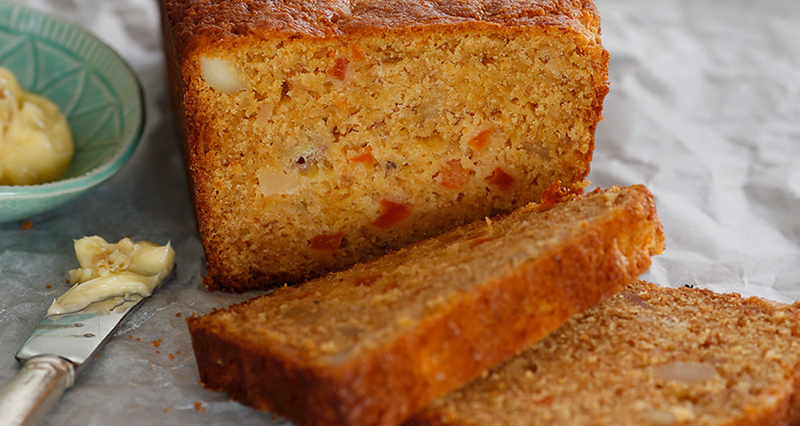 Dollop on slices of warm Papaya and banana bread. Place egg whites in a clean dry bowl, whisk until stiff peak and gently fold through batter. Heat a lightly greased large non-stick frying pan over low to medium heat. Cook 2–3 tablespoons of the mixture per hotcake, in batches, for 2–3 minutes each side or until puffed and golden. Transfer to warm serving plates and serve with berries, butter and extra syrup.